We had Bradfords and other trees blooming and then it plummeted to the 30s. Yet, can't complain because at least we aren't a foot deep in snow like the north is. STAMPS: Image and "You are" sentiment - Superheroes (Pretty Cute Stamps). PAPER: Navy cardstock (Bazzill); white cardstok (Neenah); Watercolor paper (Strathmore). INK: Alcohol inks - Amethyst, Sailboat Blue, Clover, Sunshine Yellow, Sunset Orange, Poppyfield, Shell Pink (Ranger); Copics; Watercolor for sun stencil. EXTRAS: Awesome word die (Lil Inker Designs); Stitched Scalloped border (Your Next Stamp); Sun stencil (My Favorite Things). I actually had a different plan for this card and after it started, obviously it took a turn. However, I like the end result as much or more as what I had originally planned. The pieces I didn't use are coming in other cards. Stop by the Hen House and check out all the rest of the Design Team's projects, visit their blogs and leave them some blog lovin'. Then ink up and share your projects with us, with or without the "Twist" of the theme, children. We can't wait to see what you share! Thanks for your visit, and I just became your newest follower. It sounds as though you could live in my area of the South. We have blooming trees, (some are Bradfords) - some are tulip trees, thrift is pink and tulip flowers are up. We had 30F this morning, but by late afternoon, it was 63 - pleasant if the wind was quiet. 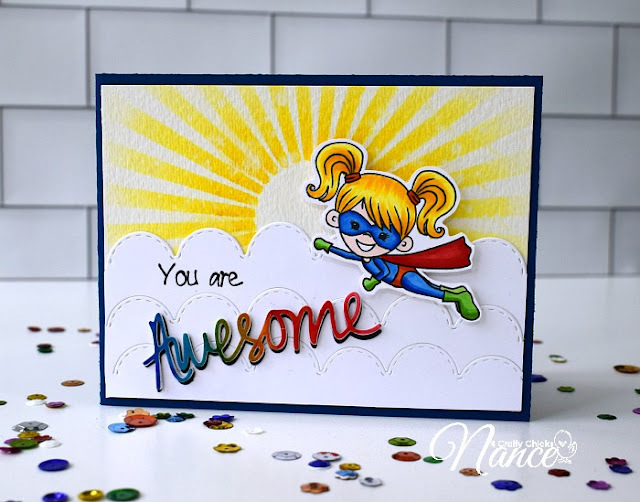 I love this superhero rainbow card. It's bound to cheer somebody a great deal with all the sunshine and I love the way you've done the clouds border. Hope you visit again and perhaps become a new follower. TFS & have a great weekend. What a fun card, Nance! Love the bright colors and the sunshiny day! It's funny how cards can go in a different direction than we plan. Wow love this is so bright and colorful, great card, way to go, friend!